Through a sequence of difficult life changing choices and events I have now found that I have been falling into wonderland. Creating things for you that communicate a feeling, capture a moment or rejuvenate a memory is an intrinsic part of my wonderland. I spent much of my life growing up near Grange over Sands in the Cumbrian Lake District and after moving around here, there and back again, I moved up the hill to my new home in Lancaster, Lancashire. I collect found objects, reclaim artefacts, buy interesting components and search the beach for driftwood and treasure. Many of these 'finds' are discovered in places contained within the view my window presents. Myriad objects are dotted around my home waiting to be used within my artworks and jewellery. I use recycled and recyclable materials and seek out fair trade components where possible. Many of the larger jewellery pieces are unique as each is always at least a little different to the next. Those choices I made all those months ago and the things that happened that were out of my control lead me to this point. I feel massively lucky that I can work from home creating things that resonate with you. My heart and creative soul have been healed and all of you have helped. I wouldn't be in Wonderland without your appreciation of the things I create and I don't mean just from your purchases. I often attend art markets with my creations, I find it touching and deeply moving when you come and share your stories and memories, evoked by my artwork. These moments I share with you clarify that my work talks in a universal language that I believe comes from the soul of the world or a collective consciousness. I feel very honoured to have won several national and international awards including the Adobe Illustration Award, the Transworld Bookart prize and the Red Eye Capture Manchester prize. I feel proud that my work has considered good enough to have been published as illustrations in children's books, magazines, on book covers and CD covers - some of which are featured in this shop. I have also written for digital art magazines and books and I was hired as a consultant for the BBC Blast project. 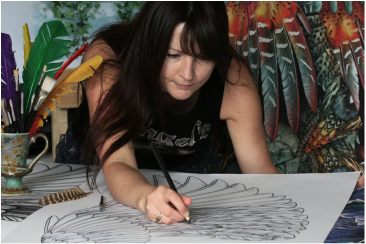 Many of my artworks incorporate traditional media such as painting, drawing, sculpture and digital photography combined using digital media. My jewellery contains fragments of these artworks and carefully selected components and 'finds'.